* Fixes 'Modify cliptext Item' dialog box redraw issue when resizing. * FTPS could produce 'Socket is not ready for use' error message. * Improved 'Invalid CR/LF, NULL' option ('Preferences'->'File'). * Fixes a Hangul input method issue. * FTP supports SOCKS5 proxy with username/password. * 'Window'->'Arrange' command could switch currently active MDI child window. * Cursor could disappear when switching keyboard. * Internal browser didn't show correctly in HiDPI displays. * Supports Edge as an external browser. * Cursor could show incorrectly when moving lines up/down. * 'Special Character' on HTML toolbar didn't work correctly on HiDPI display. * Auto save option now saves list of working files too. * UTF-8 file with 4 byte Unicode couldn't be detected correctly. * 'More' button on the Find dialog box now preserves current search string. * Print preview cause program crash when switching documents. * Fixes wrong mouse selection when column select by keyboard. * Fixes help file index in Korean version. * Supports URL Encode/Decode command ('Edit'->'Convert'). * Find dialog box couldn't update multiline input box with selected text. * 'Strip HTML Tags' command couldn't convert HTML entity numbers. * Increases max number of FTP group to 20. * Undoing line comment could cause wrong cursor position. * 'Sync Directory' option could show hidden directory window unexpectedly. * Tab key on selected text didn't work correctly. 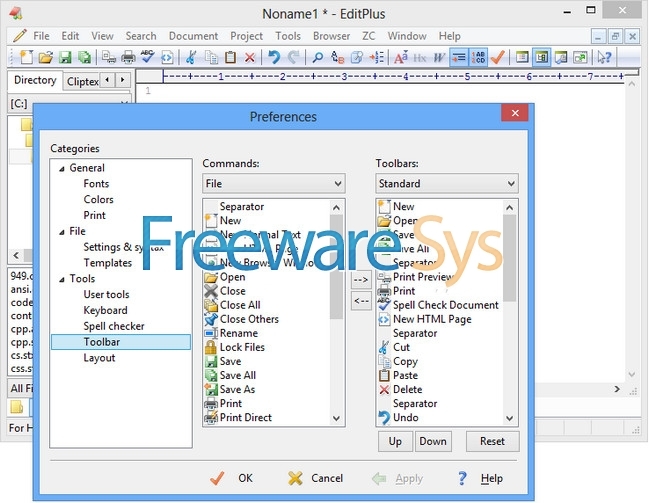 0 on: "ES-Computing EditPlus 4.0.835 (x86/x64)"